A few months back, I was browsing an ebay auction by the well-known reborn artist Helen Jalland of Tinkerbell Nursery and read some exciting news: Helen Jalland and her twin sister Linda Murray, a highly qualified and fantastic sculptor, were planning to start a business together -- The Cradle. 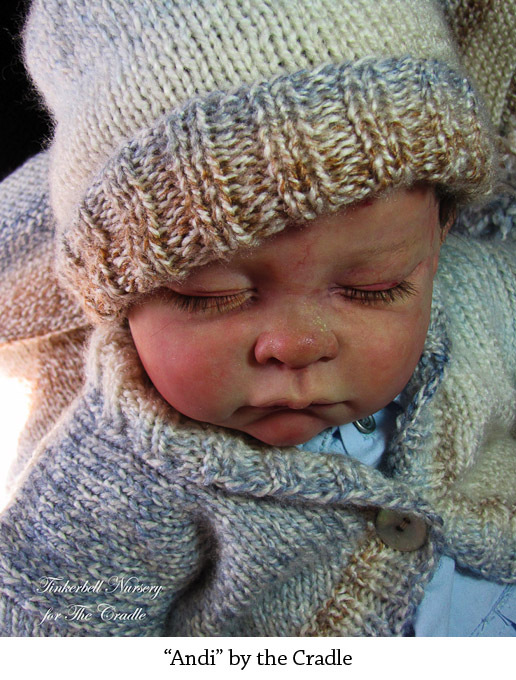 The Cradle would produce fantastic reborn kits sculpted by Linda under the watchful eye of her reborning twin sister Helen to be sure that the baby dolls will in the end be perfect for the reborning community. Together, they decide on a size and personality for the sculpt and then study photographs of real babies, looking for that one special one. Once Linda begins her sculpt, she and Helen will continue to discuss it while Linda perfects it, making sure it will translate well into a reborn kit. After weeks of work, they then send the finished sculpt off to Germany to be transformed into a reborn kit. 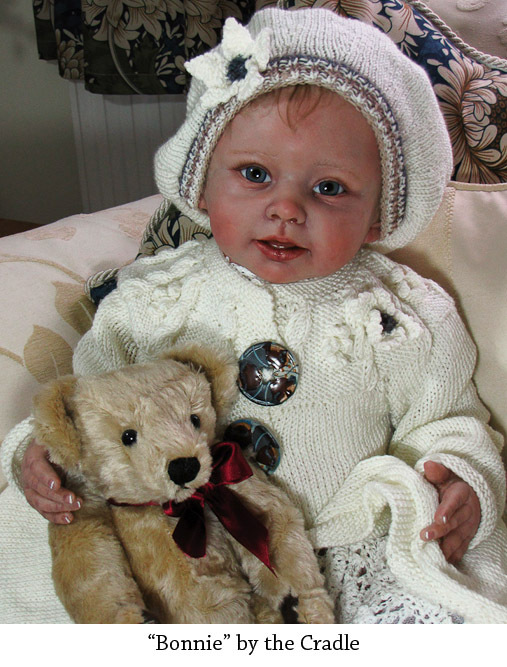 Once they receive their first prototypes more than a month later, some are sent off to the body maker and eye artist to have custom Ultrasuede doe suede bodies and custom Lauscha mouth blown glass eyes created for the beautiful reborn. 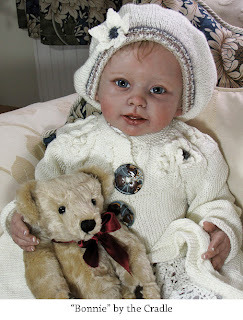 One prototype also goes to Helen, who begins to work her magic on the soon-to-be completed reborn doll, making sure all the while that it will be perfect for reborn artists, both professional and beginner alike. Thus far, the amazing twin duo have been able to provide two amazing reborn kits to the public of reborn artists and enthusiasts. 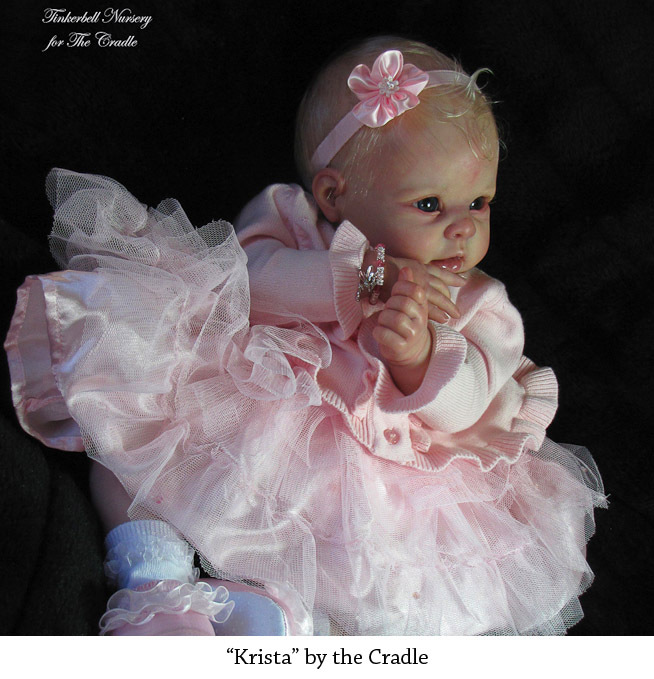 First to come to life was the darling little Krista. 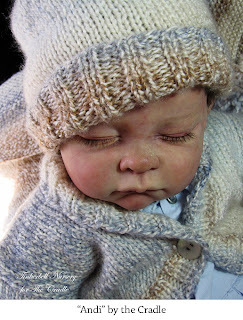 I am excited to say that I am currently working on reborning a little Krista. Her vinyl is very fine, her expression is adorable, and the custom made body is of an exceptional quality that you won't find in many other places. The second little baby they released was the adorable sleeping sweetheart, Andi. Again, I am pleased to say that I am working on that little darling as well, but this time for a custom order rather than to release as an ebay auction. I can't wait to finish these two and share photos of them! With the exceptional beauty and quality of these babies, I'm thinking I'll want to reborn more than just one of each . . . The Cradle has successfully provided us with two high quality and beautiful reborn kits, with more in the works! They have just this week released photographs of their next sweet reborn, this time it is a lovely 28 inch toddler named Bonnie. (I can't wait to get one when she is released! Expected release date is the 28th or 29th of June, 2011.) And beyond that, they currently have their next 6 to 8 Cradle Kits in various stages of productions. Based on what they've given us so far, I think we can expect great things from Helen Jalland and Linda Murray of The Cradle! Did you enjoy this post? Please spread the word by clicking one of the social media buttons below.